Need something to do today? Check out A Thing To Do Today in Singapore. Here's A Thing To Do Tomorrow in Singapore. Discover ideas for indoor and outdoor events and activities to see, do, visit and experience tomorrow for Singapore. Have an adventure. Ogle at orchids in the Botanic Gardens. 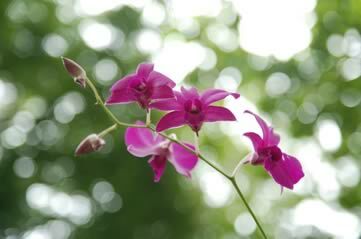 Singapore Botanic Gardens has many thousands of plants on show, but a particularly fine collection of orchids. Admire their beauty while you hear about their natural history, with a guided tour of the Healing Garden today at 9am, 10am or 11am - meet your guide at the Service Desk at the Nassim Entrance to the Gardens. A Thing To Do Tomorrow generates things to do and places to go tomorrow, online and offline, for Singapore and beyond - whether you're visiting Singapore or a Singapore resident. To see another thing to do, just reload the page. Find out more about the site, or for comments, suggestions, corrections, donations, or just to say hi, email john@athingtodotoday.com. Or check out social media @athingtodo.